Yesterday it all came together. 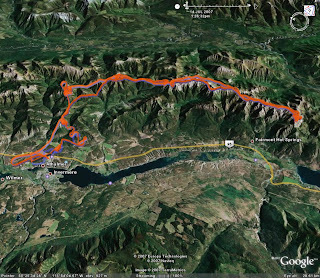 It was my first flight on my new (used) Wills Wing U2, and my first flight of the year in a hang glider, on the first day of the Willi Muller XC Challenge at Mount 7, Golden, BC. A little background - two weeks earlier, I got knocked off my bike while playing bike polo in Calgary, and hit the ground hard on my left hip. I couldn't get up for several minutes, and the next day I had a huge hematoma on my left side; I haven't been able to sleep on my left side since. After a week I had it drained in a clinic, but the next day it was back. A second draining removed 85cc of fluid, but the following day it was back again, so at the point I realised I might just have to live with it for a while. I already had another polo injury to content with, a tennis elbow that's been dogging me for a couple of months. The day before the flight, I hung in my narrow Skyline harness to see if my hip could stand the pressure of the waist straps in the harness. It was uncomfortable, but not painful, so I decided I'd try to fly, figuring that if needed I could likely tolerate even moderate pain for the few minutes required to dive down to the LZ and land. As it turned out, it wasn't an issue. On the flight day, I did the weather forecast for the pilots and noted a moderate 25 km/h NW wind above the peaks - right down the range. Lift was forecast to be strong. On days like this, it often blows out in the afternoon, so my plan was to get off early and hopefully get up and away. I was 2nd or 3rd off after two wind-dummies, at 13:15. The U2 flew just as I remembered from a demo flight 3 years earlier thanks to Chris Muller. Just one problem... one minute after launch, my vario died! From then on the whole flight was by feel, supported by my Garmin Legend cX vario, which displays a crude average vertical speed. But without audio, I was forced to turn left all the time, which my injured elbow didn't much like. But the thermals were strong, and by following a few other pilots I was soon over the peak, and then got to cloud around 3000m. I had an easy crossing over Horse Creek and glided to the end of Pagliaro, but found no lift. The wind was obviously strong, since even 300m above the peak I strarted to hit lee-side turbulence as I flew off the end and dove into sink as I headed for the 15km field. Half-way there, I pulled under 3 PG pilots circling over the forested benches, and found something. For the next while I drifted down the valley and climbed slowly. By good fortune, as I climbed higher, the thermal started to drift toward the range, and by the time I was near peak-top height, it was just a quick dash over to the rocks - where I promptly got thrashed in the turbulence. I bailed for the next peak, where another PG pilot (or maybe one of the same?) was climbing out quickly. Strong, turbulent lift took me to cloud, and from then on I did my best to stay above the peaks, since due to the NW wind, each peak was in the lee of the previous one. I took my time heading south, working each thermal I came across. Above the peaks, the wind was more westerly, so it was a case of the old "drift behind the peak while climbing, then dash for the front side in sink" scenario. Cloudbase slowly climbed to around 3500m, and once or twice I got to stuff the bar while crossing under some wispies. At the split in the range near Spillimacheen, the peak in the back had a boomer that took me to cloud, and from there it was an easy cruise to the end of the Brisco range, where I didn't find any lift. Over "TFL Mtn" to the south (so called by Eric Oddy because it has a tree-farm licence on its summit), I got some weak lift and worked it as best I could in order to gain height for the Spur Valley crossing. Above 2800m, the lift suddenly turned on, and indeed my GPS recorded a max lift for the flight of +10 m/s (2000 ft/min) - but also a max sink of 12.5 m/s! I didn't find the air to be too rough, actually, but one Cdn. team member went and landed because he found the air too rough. And Will Gadd apparently told someone it was the roughest day he'd flown in the Rockies. Another HG pilot hit sink over Mt. 7 and his sink alarm kept going until he crossed the Columbia River while on landing approach to Nicholson. I was well aware it was one of those days where you are doing a delicate dance down the range - one wrong move, and you'll be on the ground - or wishing you were! My biggest issue, in fact, was not the turbulence but the cold. My hands froze inside their ski gloves and I couldn't feel them for two hours. And my wind-breaker jacket over a T-shirt didn't provide much insulation, so I went hypothermic even though I was wearing a neck tube. It didn't help that I'd just come down with a severe cold. But I was after a 100 km flight, so there was no way I was voluntarily going to land. After reaching the Edgewater cliffs, I was confident I could reach Invermere. And indeed it was an easy stretch over Mt. Berland and then Redstreak at Radium. Canal Flats looked possible, but the cold was taking its toll. I heard later from a sailplane pilot that it was 0C at cloudbase. Yow! Not what you expect in August. I began to worry that if I continued on, I'd be too cold and too out of it to have a safe landing. So I decided to cut short my flight. I dove it in from Redstreak to Invermere, making calls on the airport frequency of 123.2 MHz on my aircraft radio to let them know I was coming. I spiralled down beside the Super 8 motel and landed parallel to runway 33 on the east side grass. The one bit of excitement while on final into the strong 25-30 km/h wind was seeing a Piper Pawneed towplane turn base leg and fly toward me. Naturally he turned final and landed behind me on the runway, while I was east of it, and I had smooth air for landing, but for a couple of seconds I was concerned about hitting turbulence off the airplane hangers to the NW and possibly getting turned towards him; the tow pilot Darren later assured me that there was never a conflict. Total time from launch to landing was 3:05 and my flight distance was 104.8 km, just over the 100 km needed for the FAI Gold Badge in hang gliders, so I was a very happy boy! Later that night, my cold moved into my chest, and I spent the night hacking, shivering, and sweating. I was too ill to fly for the rest of the week, and indeed lost my voice for several days. I'm fortunate to have seized the one opportunity I had to achieve my goal, and that the conditions favoured me. Another Golden day! Full flight details are available on paraglidingforum.com. I read an interesting post on http://slashdot.org about the problem of high prices for internet connectivity in the US. And I had to laugh, because those rates are very low compared to the rates in Canada. But then I thought, if US rates are consider too high compared to those in Europe and Japan, what does mean for *our* rates? They must be unconscionably high (which is just what many people have been arguing).